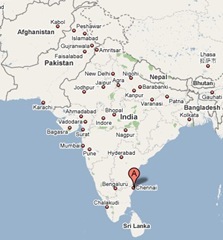 Chennai is located near the 13th north parallel and 80 degree longitude. The city stretches its 19 km length along the Coromandel coast and extends inland about 9 km at its widest. Its irregular shape covers about 172 sq km. It is a fairly low-lying strip of land, its highest point being only 60 m above sea level.Chennai is trisected by two east-flowing rivers that traverse its width. The Cooum river almost divides the city into half and the Adyar river divides the southern half of the city into two. The historic buckingham canal runs nearly parallel to the coast almost through the entire length of the city. The city has somewhat ungenerously described as having three seasons – hot, hotter and hottest. Indeed, except for four pleasant months, November to February, the weather is uniformly hot and humid…. May is the hottest season with the mercury sometimes touching 42 C and the mean temperature about 33 C. December and January are the coolest months with a mean temperature of 24 C. Howerver, the cool sea breeze (which sets in shortly after 3 PM daily) makes even the warmest of evenings bearable. But venturing out in between noon and 3 PM during April-August is best avoided. The Chennai monsoon is from October to mid-December – and in a good year (from the point of view of water-short citizens) the rain on some days during this period can be quite heavy. 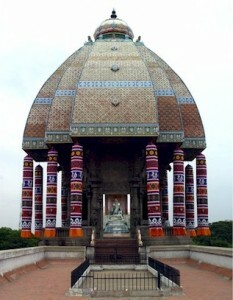 Chennai, (formerly Madras) the first city of Tamil Nadu, is a comparatively new city. The erstwhile villages of Mylapore, Triplicane, Ezhambur (Egmore) etc. all now a part of Chennai, have a recorded historical past centuries older than Chennai. Chennai, the present gateway to the South of India, is itself, however, only about 350 years old..”Madrassis are zealous gaurdians of Tamil culture which they regard as inherently superior to the hybridized cultures further north. They have, for instance, been among the most vociferous opponents of Hindi being made the national language, and Chennai is the film Center of tamil Nadu – even the State Chief Minister, Jayalalita*, is an ex-movie star.” – Quoted from Lonely Planet, travel guide to India. Particularly charming features of Chennai are its allegiance to ancient traditions, no matter how modernised it has become, and its willingness to spread out further rather than develop into a multi-storey concrete jungle. The result is a widespread city still open to skies; a green, airy city with several vestiges of its rural past; a city that adheres to the liesurely tempo of life of a world of yesterday; a city whose values of another day still survive midst of the humdrum bustle of today; a city that still retains the charm, culture and courtesies of the ages. Many major international airlines have regular direct flights to Chennai. These include: Air India, British Airways, Lufthansa, Singapore Airlines, Air Lanka and Malasia Airlines. Almost all other international airlines have direct flights to either Delhi or Bombay to which Chennai is well connected by air, rail and road. Indian Airlines has daily flights from Chennai to Bombay and Delhi and most International Airlines will arrange the domestic flight booking with Indian Airlines to Chennai, if you decide to catch their flights to either Bombay or Delhi.Chennai is connected to all major cities in India by air and its rail and road network make the tiniest village easily accessible by comfortable trains and deluxe buses. Airline resrevations from Chennai can be made at large travel agencies and the respective airlines offices. Rail resrevations can be made at Chennai Central Stations, from 06:30 hrs. to 20:30 hrs. on weekdays and from 07:30 hrs. to 13:00 hrs. on Sundays. Bus reservations can be made at Thiruvalluvar Transport Corporation, Express Bus Stand, Esplanade, Chennai. Tel: 561835, 561836. © 1999 Chennai india properties pvt ltd. All rights reserved.